Approximately 100 miles West of Brisbane, RAAF station in Oakey, Queensland opened on 14 October 1943 as the home of No. 6 Aircraft Depot. The stations function was to act as a Receipt and Despatch Unit & forward depot for aircraft operating from New Guinea and northern Australia. Over the period of two years, a large number of Spitfires and Seafires were assembled at the station. The aircraft arrived in several crates, containing engine, fuselage, and wings respectively. These were unpacked, checked, assembled and the aircraft test-flown, whereafter the fighters were painted in Australian colours and markings before being flown away for issue to an active unit. The station also operated as an aircraft repair yard, carrying out repair and overhaul work to relieve the load of its sister unit No. 3 Aircraft Depot at Amberley. The Depot was processing Spitfire, Seafire, Beaufort, Mustang Norseman and Wirraway aircraft. Of of the total of 656 Spitfires Mk. V and Mk. VIII delivered to the RAAF, serveral hundred remained in service at the end of the war. 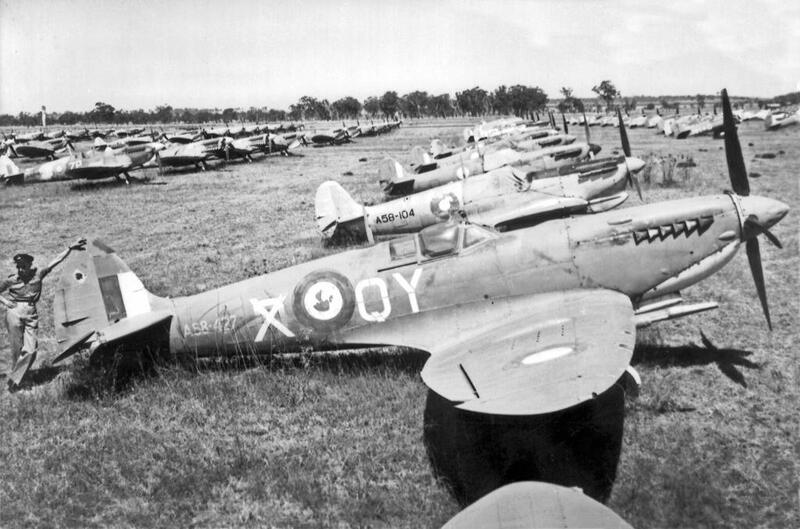 RAAF records show that 544 aircraft — 232 of them Spitfires — were subsequently flown to Oakey to be sold to scrap. The photo shows rows of sun-bleached ex-RAAF Spitfires MK. VIII and Mk. V awaiting scraping at Oakey. The nearest aricraft is the Spitfire Mk. VIII A58-427 QY*X. This machine had previously served with No. 452 Squadron and was briefly a personal mount of Sqn/Ldr Birch who took over command in December 1944. Birch marked his aircraft “D”; the remnants of this letter are still visible under the “X”. At the time there were also 61 aircraft still in crates and awaiting assembly. The fact that the fate of these crated Spitfires have not been recorded gave birth to another tale of Spitfires buried in and around Oakey at the end of World War II. Filmmakers and aircraft enthusiasts James Carter and Karl von Moller have been researching the history of the missing planes and are now ready to start the physical search in order to complete their documentary, ‘Broken Wings’. James Carter says the missing planes have become folklore in the town. “In 2000, we heard some incredible stories about Spitfire aircraft buried in the ground near Oakey. The more we researched, the more we felt the story would make a remarkable and exciting documentary,” he said. The pair have turned to crowdfunding website Pozible to raise the money to hire the sophisticated ground penetrating radar equipment necessary to search underground sites in and around Oakey and complete their documentary. “This has been a labour of love for us thus far. Now we need some investment to take all our research, interviews, mapping and analysis to the next level. Crowdfunding lets people be a part of Broken Wings for as little as $10,” says Carter. If Carter and von Moller are successful in their hunt for the missing Spitfires, the first of which will be donated to the Oakey Museum of Australian Army Flying.